The summer of 2015 was the first leg of my year away from home. Well, sort of. I grew up in Jersey City but my family hails from Mustang, a region in Nepal that is culturally Tibetan. So technically, I wasn't leaving home, I was going back to it-- back to the place that I identified so strongly with during my early years of self-discovery. I spent half of the summer in Kathmandu, then headed to the Himalayan Kingdom of Mustang to visit family and work on a volunteer project for victims of the earthquake that struck in April. Here are some photos and stories I compiled during that trip and later shared on Instagram. I've been having a really difficult time trying to verbally explain to people what I've done and seen these past three weeks while traveling the region of Mustang, Nepal. So, I'm going to attempt to share my experiences through little stories over the next few days, starting with this one. This is Buchung, a 10-year-old boy, who, when I met him last month, had a broken wrist. He slipped and fell while returning home in the dark and since the village doctor couldn't tend to his injury, Buchung and his aunt made the trek down to Jomsom, where I met him at the start of my journey. He was returning from the doctor's with pieces of string and cloth for an arm brace. Buchung said his mom couldn't make the trip because she was working on rebuilding their home, which had been completely destroyed by the earthquake. I sat next to him during our very long ride north-- think: one bus, four Jeeps (and this is after the two flights it takes to get from Kathmandu to Jomsom). Buchung was shy and clearly worn out, but his eyes lit up when he shared stories about his friends or when I showed him photos of mine. We spent the entire bumpy trek side-by-side, but I don't remember saying goodbye to him. And I think that's been the most overwhelming part of this entire trip. Meeting someone whose tiny world collides with your tiny world, but then, they just sort of dissipate. And all you're left with is a story and an image and a memory. Part of my trip was dedicated to a relief project in Namgyal, one of two villages in Upper Mustang devastated by the earthquake. If I remember correctly, 12 of the 18 houses in Namgyal were destroyed. 1) Giving the adults a basic lesson on health and sanitation. Donating medicine and first aid kits is great, but if the people of Namgyal don't know how to use these items properly, what's the point? Most of the villagers have been farming since they were little, so they've never been to school. This means they can't read the labels on bottles of medicine, which means it's likely that they often take the wrong doses or the wrong medicines altogether. So Youden, the nurse on our team, took the villagers through these basics, using colors to break things down. Blue pill, headaches. Red pill, stomachaches. Green pill, colds and fevers. She also taught them other things like how to put on a Band-Aid properly and how to use a thermometer, information that may seem obvious to you and me, but was new and incredibly valuable to the people of Namgyal. Bridging that gap was an essential part of the project. 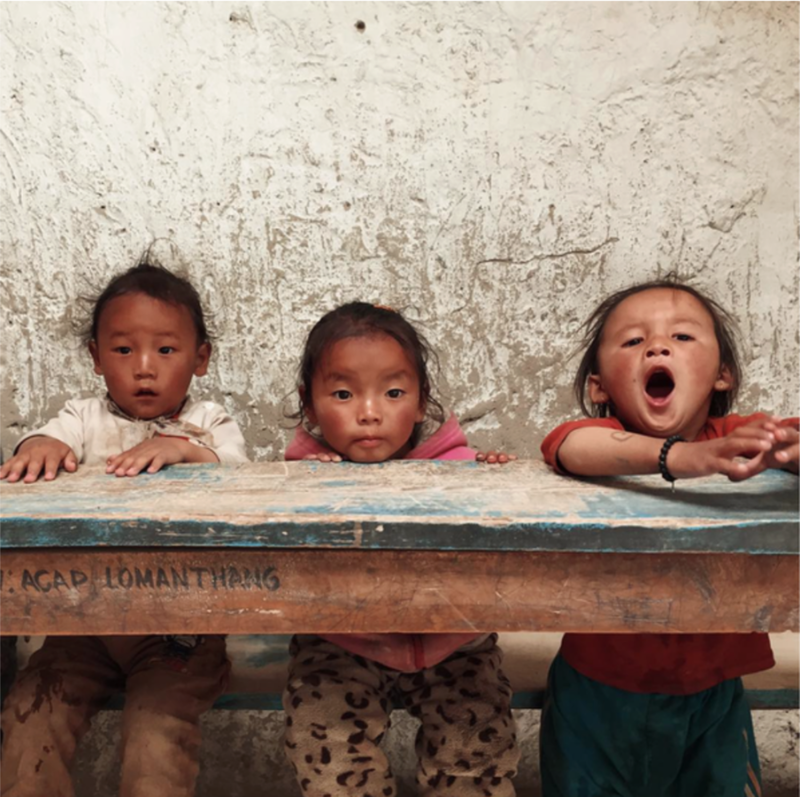 2) There are less than ten students at the school in Namgyal. They all squeeze onto two benches in a room with nothing but a chalkboard and a few torn posters on the wall. The school houses toddlers and teenagers, but only one "curriculum." When we arrived, the oldest kid was reciting the alphabet and the younger ones were echoing her, chanting in unison. Lhakpa, a teacher and member of our volunteer team (who grew up in a village not far from Namgyal), had a day full of fun activities planned for the kids. She read stories to them. She taught them about proper brushing and hand-washing techniques. And when she brought out paintbrushes and watercolors, they were overjoyed. Most of them had never seen paint before! I still can't wrap my head around the fact that had I been born a generation earlier, I would probably be living in a village and attending a school just like the one in Namgyal. Instead, I live thousands of miles away in one of the most technologically advanced places in the world, and I get to study at a prestigious global university. I am so, so lucky. Chances are, if you're reading this, you've probably also had the privilege of studying at a school that's not limited to a single room and rote memorization. We are so, so lucky. And I think we tend to forget that way more often than we should. My parents always tell me to put my education before anything else, advice I've neither gone against nor truly adhered to. I've skipped my fair share of classes in the past and I probably will sleep through a few morning lectures in the future. But I'm trying to acknowledge my luck and pay a little bit of it forward, in hopes that some of it will make its way to the kids in Namgyal. While biking through Upper Mustang, our volunteer team came across a family of nomads living about an hour away from the Tibetan border. And in typical Mustangi fashion, they invited us into their home (a tent made of yak wool) for po cha, or Tibetan butter tea. Because of the remoteness of where they live, the young girl in this photo and her little sister have never been to school and don't have other children to interact with. So three of our volunteers decided to sponsor their schooling until they both complete 12th grade, meaning they'll be sent to a boarding school in Pokhara within the next few months. Two of those volunteers were also sponsored when they were younger, and one of them is now a teacher in New York. Full circle!